The party, at first glance, seemed unremarkable — a throng of techies and engineers swigging beer and milling around an open office space. 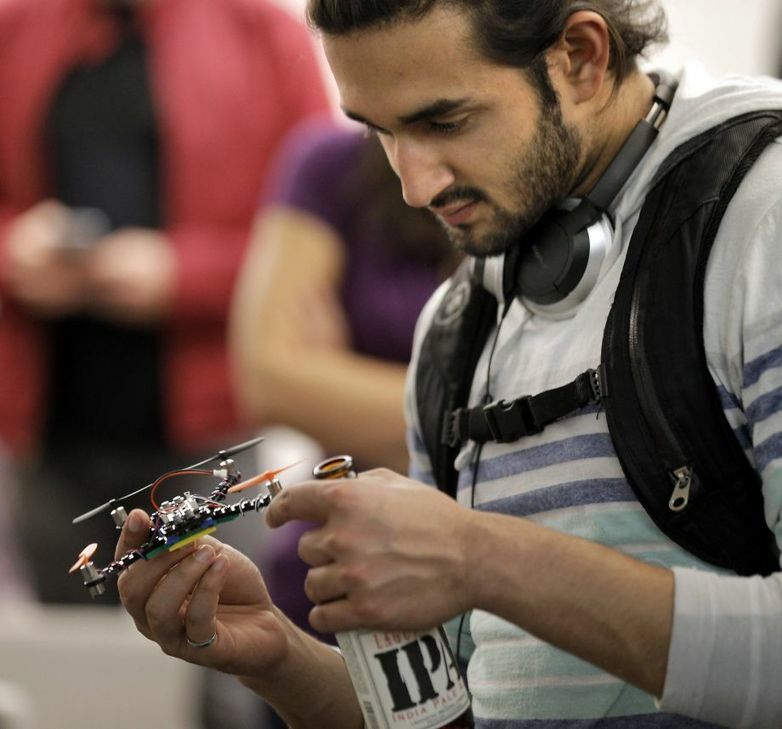 There were no humanoids — this time — but a robot dog, drones, a bionic eye and a roving rubber duck mixed with a few dozen people at Silicon Valley Robotics’ monthly San Francisco meetup, Bots and Beer. The event, which in one form or another has been going on for nearly five years, recently found a new home at the South of Market headquarters of Comet Labs, a robotics and artificial intelligence venture capital fund. “People who work in robotics or other related fields get split off by market segment really quickly in the real world,” said Erin Rapacki, who works at industrial automation firm Pneubotics and has attended robotics meetups for several years. Silicon Valley Robotics, a nonprofit group that hosts events and supports robot innovation, hosts two Bots and Beer parties a month, one in the South Bay and the other in San Francisco. On April 6, the group will convene for a Robot Block Party — a fair at the Jabil Blue Sky Center in San Jose, where robots and their creators will put on demonstrations and educate the public in honor of National Robotics Week. Keay, a robotics startup investor who founded Robot Garden and serves as the managing director of Silicon Valley Robotics, said each event brings new faces, both flesh and metal. John Meadows, an industry pioneer who helped invent the robotic arm and now owns Able Design, is a regular at the meetups. Smith demonstrated his gadgets during the event’s opening “show and tell,” and let Platinum, the robotic dog, roam freely for the rest of the event. Others showcased new gadgets or ideas in the making, including Holly Kasun, whose company plans to launch a fundraising campaign soon for an autonomous flying camera called Flybrix, and Tyson Messori, the co-founder of Scanse, a company that designed a 360-degree scanning sensor called Sweep. You never know who/what is going to show up!